A chosen card appears beneath your cell phone like magic! "Beneath" is John Kennedy's new card under phone effect. 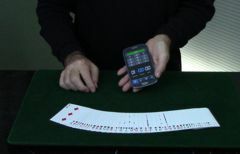 The clever gimmick allows you to make a chosen card appear under any cell phone or card box in about half a second! The card can appear as many times as you like. It can even be signed by a spectator. But that's just the tip of the iceberg. Beneath also does card transpositions and predictions! And John will teach it all to you on video. You'll receive a CD-ROM that plays on any Windows or MAC computer's CD/DVD drive. John teaches you how to make the gimmick; it's very easy. He also shows you his favorite routines and handlings. You'll marvel at the possibilities!